Time: 9:00 a.m to 5:00 p.m. The “Internet of Things” (IoT) is the term used to describe the networking of devices that have not traditionally been used to collect or process data. Internet connectivity and data collection mechanisms are being added to devices as diverse as pacemakers, athletic equipment, light bulbs and coffee makers. As the networking of these devices becomes more prevalent in everyday life, legal and policy issues are now at the forefront of business and regulators’ agendas. For example, the FTC and other government organizations have expressed concern over privacy, security, and even technological and financing considerations. This conference seeks to address these wide-ranging issues and explore the legal framework that can support innovation along with the protection of society. The first panel will set the stage for the day with demonstrations of technologies that are cheap and quick to build and that illustrate the promise of connected devices. • What are the new or distinctive security issues raised by the IoT? • Is it better to understand security in the IoT as “device security” or as “network security?” How are priorities set? • What are some of the implications of a data breach of an IoT-connected device? If a security breach does occur, does this leave potential for a chain reaction of breaches across systems? How could the likelihood of this problem be reduced? • Should the legal system incorporate IoT breach notification laws? Who should be notified, and who is responsible for notification and mitigation of damages from a breach? 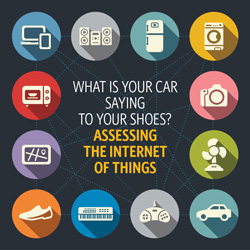 • What kinds of tort liability may arise from the use or sale of IoT-connected items, and does the IoT affect traditional tort liability? • Who should have access to data streams? How should access be obtained? Should there be any procedural checks in place? If so, what should they be? • How should bandwidth be allocated? Are there certain industries that should receive priority access to spectrum? Will there ever be a problem with access and connectivity? • How do corporate and financial regulations affect start-ups and capital investment for the IoT? Bradley Merrill Thompson, Member, Epstein Becker & Green, P.C. • What are some of the major issues that arise from an interconnected system of medical devices and healthcare? • The medical devices industry is heavily regulated; so what difficulties will medical professionals, patients and innovators face if utilizing an IoT? Is HIPAA sufficient to protect patients even in the face of the IoT? How might the IoT affect traditional medical malpractice liability? • Health optimization: how will the IoT affect general wellness? What effects will this have on the insurance industry? What about government-mandated insurance? Marell Battle, Store Manager, Nicholas Kirkwood Ltd.
• Is there a way that technology may be adapted to the needs of smaller operations, as well as to the larger department stores and discount fashion chains? What are the advantages smaller operations and start-ups may gain from a network of systems? How will aggregation and analysis affect the role of brick-and-mortar stores? How will it optimize the way we shop? • How do we stay ahead of some of the privacy issues of interconnected clothing or personal items, and networked systems? How does the IoT currently affect designers, producers, and other members of the supply chain? How will it affect them in the future? • Are there other aspects that should be regulated, and why (e.g., specific forms of anti-competitive behavior)?